Czech telecommunications company, České Radiokomunikace (CRA), has announced the deployment of a nationwide LoRaWAN-based network. The network gives access to Semtech’s LoRa technology to 75% of the Czech population with plans for continued network expansion. České selected Semtech’s LoRa Technology for its open ecosystem and the flexibility it provides for IoT applications. 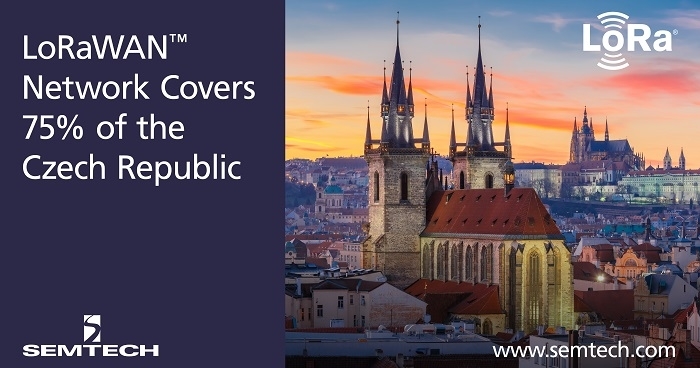 There is a strong push in the Czech Republic to replace manual utility metering with an Internet-based, Cloud-enabled solution. Currently, CRA has 8,000 active metering devices deployed across the country and plans to increase this number to 20,000 by the end of 2019. With the number of smart meters increasing in the country, energy consumption has dropped by as much as 30%. According to a recent ABI Research report, nearly 20% of utility meters worldwide will be connected using low power wide area networks (LPWANs) by 2026. Semtech’s LoRa technology is a widely adopted long-range, low-power solution for IoT that gives telecom companies, IoT application makers and system integrators the feature set necessary to deploy low-cost, interoperable IoT networks, gateways, sensors, module products, and IoT services worldwide. IoT networks based on the LoRaWAN specification have been deployed in over 100 countries and Semtech is a founding member of the LoRa Alliance, the fastest growing IoT Alliance for Low Power Wide Area Network applications.